It is almost too easy breaking the neck of your victim. But as he falls to the floor dead, you do not let him escape so easily. He is brought back to serve a new cause, and your faction doubles in size. Conversion successful. Lord, I was (re)born a shamblin' man-chicken. Welcome aboard you undead chicken of doom. Now to try to get through this day and then the next day to find the next chicken to join the undead army. I'll leave it up to you as to whether to tell me your masked account ID. Guess it's just a matter of how much you trust CAD's Night 0 post. But as far as I know, I have every reason to keep you alive-- and will for the rest of the game. Might as well since I'd hope that we wouldn't intentionally be given bad information. Withholding information sure, but since our little cabal was told we could not be converted I don't think he'd change that. Not to say there might be someone/group out there that might be able to get past it, but as written we can't be converted. Plus if I go we all go. I'm the grand leader Caracalla. Here to grant freedom to all chickens within our empire. Cool. I was just a vanilla Chicken, btw, so I have no extra powers (not sure they would have survived my death anyway). Oops! Wrong forum there, huh? Yep. Messed up there. Don't think it will be too big a deal since it's not like I identified myself or anything. Can't delete it either. Sent a PM to Clearasday so maybe he can delete it. Will have to wait to put my vote in (and will need to change it) in order to keep from tying myself to my mask account. Though since I used the whole Oracle thing it anyone saw it that would likely tie it to me. Hope I didn't just mess it up for us. Visigoth wrote: Though since I used the whole Oracle thing it anyone saw it that would likely tie it to me. Hope I didn't just mess it up for us. I only saw a "d" when I first looked at your post. I actually posted a vote for Romulus. Left it up less than a minute, but someone may have seen. Also, I quoted Cicero, so anyone who saw it in real time can probably figure out I'm neither Romulus nor Cicero. Ozymandias wrote: I just misposted too! I think we just found our tradition for this group. I think Scipio is necklessone. Alright I suppose it's time to start thinking game strategy. My guess is that there were 6 cult leaders at the start of the game, including you. So that probably leaves us with 5 cults now (though depending on the order of operations it's possible MEM converted someone before he died, who may even have ascended to Elder Chicken of Repute). There are probably also about 4 Foxes/Sociopaths, who probably are rotating through Night Kills after taking Night 1 off. btw, I thought it was strange that a lot of players were treating the Foxes as a coherent Wolf-like faction on Day 1. I'm assuming that no one had a teammate on Day 1 (with the exception of possible Lovers), so there's no real point to analyzing Day 1 voting. So I don't get Romulus attacking Scipio-- if Romulus really is Ryvvn, he should know better, so he might have been trying to scapegoat Scipio to protect a teammate who got an early vote (Constantine or Diocletian?). Anyway, that's why I was going to vote for Romulus until I misposted-- but I didn't want to risk it afterward. Our conversion may be based on masked names, but that doesn't mean other cults can't target our actual accounts. And even though we can't be converted, a failed conversion attempt could kill us. All of which is a long-winded way of saying I wouldn't mind Romulus getting lynched today. Now for the big question: who should we recruit today? I think we should avoid anyone who received multiple votes yesterday: Constantine, Diocletian, Scipio, Valerian. Why? Because I cast a late third vote on Cato, and even though I obviously wasn't trying to protect anyone, if I die players are going to suspect that I might have been. So we should steer clear of those four-- not just tonight, but possibly for the rest of the game. As for tonight, I'm wondering if Caesar might not be the best conversion choice? Both of you voted for Valerian yesterday, and since players might think you converted him on Night 1, after he dies they won't be expecting a fellow Cult member to be the only other voter on Valerian. Also, if Caesar is sphenodont as I suspect, he'd be a good addition to the team-- especially if some powers are main account based. Since he's not one of the more high-profile players, he's less likely than I am to get targeted by a Seer or Vig or Maul. Constantine wrote: There is something wrong here. Tiberius is a chicken, or at least he was a couple days ago. Did Constantine just out himself as a Seer? Weird. And if so, did he Seer me on Night 0? Or does Seering occur before conversion? Sure seems that way but odd he'd come out this early. Maybe some groups have some Seer powers? Though if he did hit on a fox perhaps that's why he decided to strongly hint that he's the Seer. Could also be a head fake to see who bites. And necklessone again for another mispost. I started a trend. Well I've just taken the crown. I did it AGAIN! Ugh. 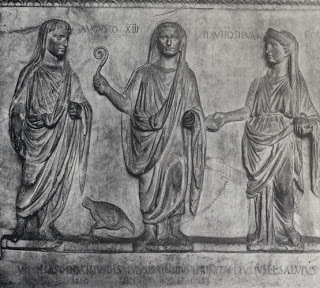 Caesar wrote: The last minute tie vote from Diocletian looks to me like a saving Scipio vote which again either means: a cult allegiance; foxes; or possibly nothing at all. So I also vote for Diocletian. I know people are going to think I fake misposted, but honestly it took me like 10 minutes to find those images on the web (since apparently you can't just upload images from your computer into a post). Anyway, we have to assume Romulus now knows I'm not Caesar or Diocletian. And he'll also probably correctly assume I haven't yet voted today. I think Okaros might be Cincinnatus, trying the "oh he would never post right after CAD mentioned he was in the game" ploy. I like Caesar as the next conversion. It is interesting that another cult is at 3 already. So they must be able to convert each night. Would hope that they'd have some "downside" as a result of being able to convert each night. I might vote on Valerian. Mainly do to him basically moving his vote to somewhere that it doesn't really do him much good. Assuming my numbers are right he's in the lead position at 4 votes with 3 others at 3 votes. So instead he puts a second vote on Constantine? Odd choice especially when Constantine has dropped a little bit of a Seer crumb. Though by pushing him even further ahead it might look like I was trying to protect one of the others at 3 votes. Was thinking of Hadrian as well. Though since you are already voting on him it might be too much. But then again it might not be. Could also help that if you are nabbed they wouldn't look as closely at me. Could also go somewhere else and either tie up someone or move someone closer to the pack. There is a certain bit of freedom having a mask account since I could do things that normally I'm sure someone would try and make into a big deal about it being not how I normally play. Last edited by Visigoth on 27 Jun 2014, 15:44:10, edited 1 time in total. If Constantine is the Seer he might have gotten you Night 1 post conversion and the result might have been something like "Former chicken" or something like that. So since it wasn't a fox result he would know that you were a chicken at one point. Or the conversion happens after the Seering so he was simply stating that when he looked you were a chicken but since time has passed you might not be anymore. Either way it certainly feels like he's a Seer posting some results. Only two so perhaps his Night 2 one was Trajan. If so it would be great if the others would vote him out but everyone would have to miss the rather obvious hints he was dropping. And voting on him could put you on the list of people he checks which I'd like to avoid. Though I'd think the foxes would target him next due to the hints he dropped and them/they (if individuals) would want him gone sooner rather than later. I'm also wondering about if there are really foxes in the game. Meta4's title sure seemed like a GA type, but it only mentioned protection from conversion. Now there could be another GA type out there that protects against non-conversion night actions, but doesn't feel right. The message today talks about the largest group being a cult with 3 members. If there was a unified fox group I'd think they would be the largest group at the moment. So if there are non-cult threats out there I'd think they'd be of the sociopath type out for individual wins. It is still rather amazing that on the day we lynch a cult member that the leader of that cult also gets killed. Coincidences happen, but that sure does seem strange. Dammit, started a post in the main thread under my normal account. At least this time I realized it and stopped what I was doing. That will make you look a bit suspicious-- basically, you'll be tomorrow Diocletian. So you might want to consider switching off of him at some point in final hour. Admetus just asked for a vote count in a mispost. That might be because he hasn't voted yet, which would fit my theory that he's either Augustus or Valentinian. Unless he does turn out to be a fox/sociopath or the like. I have an easy reason why the vote then since I was following what appeared to be a post by someone claiming to be the Seer. If he doesn't turn out to be one of them I'll use the same excuse saying it looked like Constantine was dropping Seer clues and I followed them. Might change it. Guess changing it would help disguise who I am since I rarely ever change my votes. Visigoth wrote: Unless he does turn out to be a fox/sociopath or the like. I have an easy reason why the vote then since I was following what appeared to be a post by someone claiming to be the Seer. If he doesn't turn out to be one of them I'll use the same excuse saying it looked like Constantine was dropping Seer clues and I followed them. Actually, now that Valerian has called you out, why don't you explain your vote in the Day thread? Because Valerian voting for a possible Seer is a very good reason to vote for him-- and would have also have the benefit of making me look less suspicious to those who might have missed Constantine's potential Seer claim. Okay good I think you're pretty safe now, even if Valerian does get lynched and revealed as a vanilla Chicken. Hmm, I wonder if we should conditionally convert Valerian > Caesar? Because if Valerian dies at a later date, no one's going to think that you two are in the same cult after your exchange today. Ozymandias wrote: Hmm, I wonder if we should conditionally convert Valerian > Caesar? Or would they think exactly that knowing that I know that they know that they know that I'm a cow. Wait, that's not how that was supposed to end. But I think that certainly could work. So let's take the heart of Valerian > Caesar tonight. Also you have a vote in this as well. At least when it say "all members will vote democratically" I'd assume that means all my disciples get a vote as well. I'm generous like that. I'd guess Augustus is Admetus due to wanting a vote count. Visigoth wrote: I'd guess Augustus is Admetus due to wanting a vote count. Or he's on Admetus' team and Admetus asked him to ask for a vote count. If you like, you can easily rebut Valerian's auto-defense argument by pointing out that Hadrian has more votes than Constantine and is also voting for Valerian.